> All of the Division Series have come to a close. And, considering it was the first time in history that all of the necessary DS games were played- each series went to five games for 20 games total- I don’t think any of them was a bad series. > The Giants came all the way back from an 0-2 deficit in their series against the Reds and won three straight to reach the NLCS. Their offense was non-existent during the first two games. But, after a Scott Rolen error in the 10th inning of Game 3 gave them a gift win, the offense exploded in Games 4 and 5. The highlights were Pablo Sandoval’s two-run homer in the seventh inning of Game 4 and Buster Posey’s grand slam in Game 5 that pretty much sealed the series. > The Tigers nearly allowed the other Bay Area team- the Athletics- to come back from an 0-2 deficit against them, but Justin Verlander was having none of that. He threw a four-hit shutout with 11 strikeouts to abruptly end the A’s miracle season and send the Tigers to the ALCS. > The Yankees’ offense only showed up for one inning during the entire series with the Orioles, but CC Sabathia didn’t need much yesterday. He threw a complete game to also end a dream season for the O’s. The big story was that Alex Rodriguez- the highest-paid player in baseball- was benched in Game 5 of the series, but Raul Ibanez’s .444 ALDS average picked up the slack. > Despite the fact they were down 6-0 early, the Cardinals did exactly what they did in the 2011 World Series. Down 7-5 going into the ninth inning, they ambushed Nationals closer Drew Storen with four two-out runs. With the bases loaded, Daniel Descalso hit a hard ground ball up the middle that deflected off of shortstop Ian Desmond’s glove- I leave it up to you as to whether or not Desmond should have had the ball- and boom, tie game. Then Pete Kozma, some rookie shortstop that no non-Cards fan had heard of until late September, hit the go-ahead two-run single to sink the Nats. > PLEASE quit calling the Cardinals a “cinderella story.” Yes, they won in dramatic fashion last night, but that doesn’t put them in that category. A cinderella story is a team that, at the beginning of the year, is expected to finish near last in their division, then go on to have a miracle season. This year, that was the Orioles and Athletics (you could argue the Nationals, but I don’t think anyone expected them to be terrible this year). Sure, the Cards lost Albert Pujols, Tony La Russa, and Dave Duncan. But there was still way too much talent on that team coming into 2012 for them not to contend. So I guess if you expected the Cardinals to finish in dead last and lose 100 games coming into this season, then sure, they’re a cinderella team to you. But there’s clearly a problem if you expected that. I actually had a tough time picking for the Giants, but Sandoval was the only Giants hitter to hit over .300 for the series. And I couldn’t give it to a pitcher, since the starters especially underperformed in this series. The rest of MVPs were rather easy, however. > Shaun Marcum doesn’t expect to pitch for the Brewers next year. > Following outright assignments, relievers Vinnie Chulk and Tim Dillard each elected free agency. > The Brewers also outrighted Cody Scarpetta and Eric Farris to Triple-A Nashville, but neither has the right to elect free agency. > News has surfaced regarding Francisco Rodriguez and his arrest for domestic violence sometime in September. The incident took place in Wales, a suburban city about 45 minutes to an hour away from Milwaukee. But apparently K-Rod has a history of things like this that I wasn’t aware of. In late 2010, he had to take anger management classes after “an altercation” with one of his relatives at Citi Field during his days with the Mets. It seems he’s doing everything he can to make sure he can’t find a deal anywhere else for 2013. His horrible 2012 campaign made it bad enough, but you can bet teams that see this on his resume won’t be impressed. White Sox: Outrighted Ray Olmedo, who elected free agency. Blue Jays: Outrighted Jesse Litsch, Aaron Laffey, Bobby Korecky, Robert Coello, and Scott Richmond, all of whom elected free agency. Pirates: Outrighted Doug Slaten, who elected free agency. Padres: Outrighted Ross Ohlendorf, who elected free agency. Rays: Outrighted Brooks Conrad, who elected free agency. Indians: Outrighted Shelley Duncan and Luke Carlin, both of whom elected free agency. Red Sox: Outrighted Jason Repko and Guillermo Quiroz, both of whom elected free agency. Giants: Outrighted Shane Loux and Justin Christian to Triple-A. 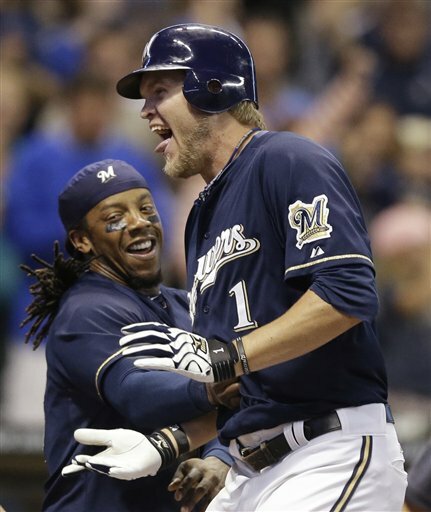 > The Brewers absolutely annihilated the Cubs tonight, demolishing their rivals 15-4. It was actually a rather close game through eight innings, but the Brewers put up a very crooked number- a nine-spot- in the ninth inning. Basically everybody had a good day at the plate. Aramis Ramirez went 3-for-4 with four RBIs and Ryan Braun went 4-for-6 with five RBIs, those just being the highlights. But the biggest blow was to start the ninth inning, when Braun, Ramirez, and Corey Hart hit three consecutive home runs off Alex Hinshaw. And Braun’s home run went out of Wrigley Field. Yeah, it was that kind of night. > With September just around the corner, most teams are probably starting- or already have- looking over prospects to recall and take a look at. Last year, the Brewers were contending at this time, so they only called up four players who they thought would help them to the postseason- Taylor Green, Logan Schafer, Martin Maldonado, and Mike Fiers. Maldonado and Fiers are both having success on the Brewers roster right now, and that month of experience at the big league level could have helped them. Green, 3B: Green has already spent time with the club this year, but was optioned back to Triple-A in July after most of his playing time diminished. His .198 batting average at the big league level probably didn’t help much either. Green is hitting a sub-par .269 at Triple-A this year, but is hot over his past 10 games, with a .300 average and three home runs. Green is blocked at basically every position he plays- third base (primary), second base, and first base- at least for the near future. If he were to win a shot at the Brewers’ roster in 2013, it would be a similar role that he played earlier this year (utility/bench player). But he’d have to prove he can still swing the bat even without full playing time. Schafer, OF: The speedy outfielder is hitting .270 with nine home runs and nine triples for the Sounds this season. He had a decent Spring Training, but didn’t really have a chance at making the team because the Brewers had (and still have) five big league caliber outfielders. With Nyjer Morgan likely leaving for the free agent market next year, Schafer could make the team as the fifth outfielder, but that still might be a long shot. Schafer got the call last year, and got one hit in three at-bats for the Brewers. Caleb Gindl, OF: Gindl typically hits for average, but is having a bit of a down year this year with just a .263 average. He’s very likely to get called up, though, having won the Pacific Coast League Player of the Week last week after posting a monster .533 average. Gindl hasn’t seen any Major League time yet. Brandon Kintzler, RP: I’m almost certain Kintzler will be a September call-up, and that would complete his journey back. Kintzler was a September call-up in 2010 and was rather ineffective then, but made the roster out of ST in 2011. He posted a 3.68 ERA in nine games in ’11 before going down for the year, and he’s been out ever since with a series of elbow and shoulder problems. Kintzler currently has a 3.23 ERA between Single-A, Double-A, and Triple-A. Personally, I see a bright future for Kintzler. His stuff tells me he could be a future setup man, which is exactly what the Brewers need right now. Rob Wooten, RP: Wooten is probably a long shot, but I wouldn’t mind seeing him come up. He posted a stellar 1.74 ERA with eight saves in 17 games for the Stars, and is now playing for the Sounds, where he has a 3.88 ERA. I considered Jim Henderson (before his call-up) and Wooten the two best relievers in the Brewers organization this year. Fautino De Los Santos, RP: The Brewers quietly acquired De Los Santos in the deal with the Athletics for George Kottaras, and he could be a talented arm. He posted a 4.32 ERA in 34 games for the A’s in 2011 and is an extreme strikeout pitcher. He also walks his fair share of batters, which draws him an alarming comparison to Jose Veras, but we just have to hope no one else can be that bad. Tyler Thornburg, SP: Thornburg was up for awhile with the Brewers earlier this year, making two starts in July. He struggled with long ball, allowing seven homers at the big league level, more than he had allowed during the entire season in the Minors. But, if the Brewers do indeed shut down Mark Rogers and/or Fiers, Thorn could see a few starts in September, or at least work out of the bullpen. Wily Peralta, SP: Already a leading candidate for the rotation next year, the Brewers have said that Peralta will more than likely make some September starts (more likely than Thornburg). Peralta has just one inning of big league experience, which came earlier this year against the Rockies. 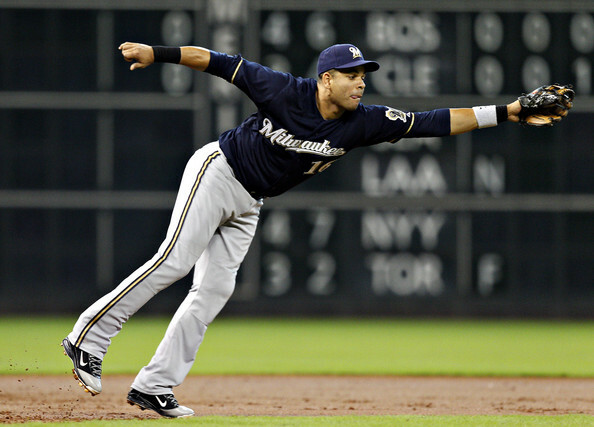 My only concern about Peralta is that he can let his nerves get to him at times- at least in the past. In ST of 2011, the Brewers gave him a few starts, and he got rocked- and I mean rocked– each time. That’s probably behind him by now, but it’s something worth watching out for if he’s in the bigs this September. If that is in fact behind him, though, watch out- he has some of the best stuff I’ve seen out of a Brewers prospect in quite some time (probably since Yovani Gallardo). His two best pitches are a high-90’s running fastball and a slider, which, not surprisingly, were the only two pitches he used in his debut (which was in relief). But he’ll be forced to at least bring out the change-up or curve if he’s starting. Eric Farris, 2B: He has just one big league at-bat under his belt, but this kid has a ton of speed. Farris isn’t a power hitter, but does have a career .287 average, which tells me he’ll eventually become a good lead-off hitter/table setter. Farris is blocked for the next few years by Rickie Weeks, whom the Brewers just have too much money invested into to give someone else a chance. Scooter Gennett, 2B: Despite his small stature, Gennett has a ton of potential, probably more so than Farris. Like Farris, he has speed and hits for average, with a career .302 Minor League BA. 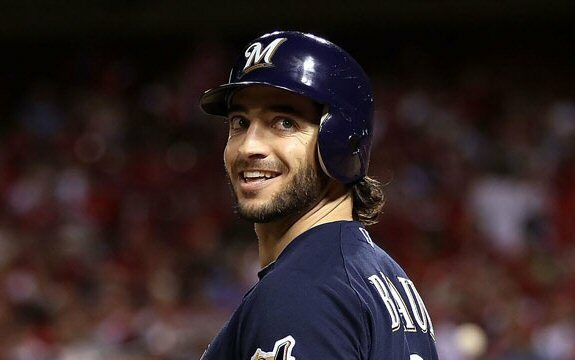 He’ll probably eventually be the Brewers’ starting second baseman if Weeks continues to flail himself out of the job. But, like Farris, Gennett is at least blocked until Weeks’ four-year contract ends. Obviously not all of these guys are going to be called up; the clubhouse would turn into a mad house. But I’d say the most likely to be called up of the players I listed are Green, Kintzler, and Peralta. > Ron Roenicke said it has yet to be decided on whether or not Carlos Gomez will be the starting center fielder next year. > Tim Dillard was optioned to Double-A. I hadn’t picked up on this, but Dillard had a 9.42 ERA since being sent back to Triple-A a few months ago. Sort of why he wasn’t on the prospect list. > 15 runs. 21 hits. > Every Brewers starter- including Marco Estrada- had a hit tonight. > The ninth inning lasted almost exactly 35 minutes. It took the Cubs 25 minutes to record an out. > Every Cubs pitcher, except Alberto Cabrera, gave up a run tonight. Justin Germano, Michael Bowden, Manny Corpas, Hinshaw, and Lendy Castillo all got their heads blown off. > Brewers pitchers have quite a streak going- seven consecutive games with 10 or more strikeouts. That’s the longest streak of its kind since 1900. > Estrada notched his second win of the season tonight. Both have come against the Cubs. I sort of wasted most of this article on the September call-up piece, but I wanted to get that up at some point before the month ended. I would have saved it for another day had I known this game was going to happen, however. > The Cubs needed Joe Mather, an outfielder, to finish the ninth inning for them.